Clientele, who are working tractors in narrow and tight applications like vineyards or orchards, now have reason to be excited about Kubota’s new M Series Narrow Tractor. 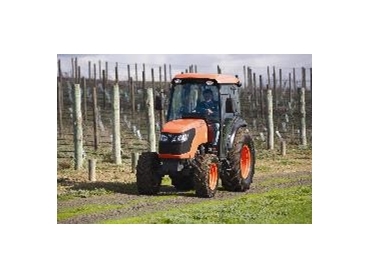 When Kubota engineers visited Australian vineyards and orchard farms in recent years for research, they found that owners and operators of cab narrow tractors were asking for a powerful compact tractor, with good manoeuvrability, a quite cab with enough room for the tallest operator, while being reliable and keeping running costs low. These key points were taken in consideration when the new 85 horsepower M8540 Narrow tractor was designed. Kubota’s new turbocharged four valve Tier 3 compliant four cylinder center-direct injection diesel engine, is built to deliver plenty of power when pulling heavy trailers up steep hills or running high volume sprayers. The hydraulic shuttle transmission is designed to achieve the best efficiency and productivity, with a five speed synchronized gearbox and three ranges including creep speed. The tractors top speed is rated at 38km/h. Wet disc brakes are maintenance free and enhance the brake stopping power of the tractor over dry brakes. When the brake pedal is applied, the tractor automatically engages four wheel drive (4WD), although the tractor may only be in two wheel drive (2WD) mode. The PTO and 4WD are electric over hydraulically operated and are engaged by a push of a button. Standard PTO speeds of 540/540Economy, allow for light to medium duty PTO implements to be run at lower engine rpm to reduce noise levels and save fuel. Kubota’s exclusive Bi-Speed Turn feature rotates the front wheels at a speed of almost twice the speed of the rear wheels, whenever the front wheels exceed a turning angle above 35 degrees. The result is a smooth, extreme tight turn into the next crop row on the first attempt, which is ideal for vineyard and orchard work. The new fully integrated cab of the M8540 Narrow Tractot is of course built and designed by Kubota. Wide opening doors that are hinged at the back of the cabin and a flat cabin floor allow for easy access into the cab. Once sitting inside, even tall operators will notice the spacious feel for a tractor of this category. Head space, all around visibility and a low noise level were high up on the design list. All controls are in reach of the operator and can be found on the right hand console of the cab. Whether you try to beat the heat of a hot Australian summer day or stay cosy during the chill of winter, the high capacity air conditioner and heater system puts you in charge of the climate. The new Narrow tractor cab also features a standard tilt steering column, CD Radio, two front and rear halogen work lights and front/rear windshield wiper and washer. With a wheelbase of 2050mm, its low overall width of 1490mm on the standard 420/70R24 rear tyres or 1430mm on the optional 380/70R28 rear tyres, the tractor measures a minimum height of 2320mm and weighs in at 2410kg. The maintenance is very simple with only a few daily service checks. The easy to reach double fuel tanks hold 80l of diesel and are made out of metal rather than plastic material.